krow communications limited has created a new Christmas campaign for DFS, the UK’s biggest sofa manufacturer and retailer. Using the iconic, hand-crafted Aardman characters which first broke with DFS’ Christmas delivery ad last November, this year’s ad focuses on the fact that Autumn and Winter Collection sofas are currently up to half price, with many guaranteed to arrive before Christmas. The campaign, which breaks today, runs across TV, press and digital, including online video and social, with the 30” spot running for five weeks across all major TV channels. The campaign showcases the lengths DFS goes to in order to ensure its sofas will be delivered in time for Christmas, thereby bringing to life the DFS brand purpose of delivering the joy of comfort to customers. The 30-second film, entitled ‘Joy of Home’, follows real DFS employees Dom and Will as they deliver sofas and joy to customers’ homes. Having diligently handed a variety of new sofas to a selection of delighted customers, all preparing to celebrate Christmas, Dom looks longingly out of his van’s window. His family are overjoyed to see him, having been waiting on the sofa for him to return, when he finally lets himself into his own home. There is an emphasis on the idea of being at home for Christmas and the film ends as Dom, his wife, Stephanie, and son Noah all enjoy a happy moment on their own DFS sofa. 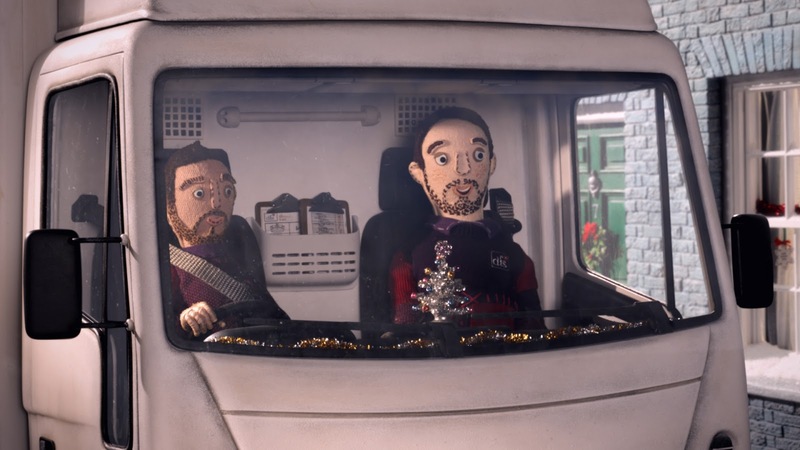 The campaign is the seventh for DFS featuring Aardman designed characters, which are based on real employees of the sofa company.